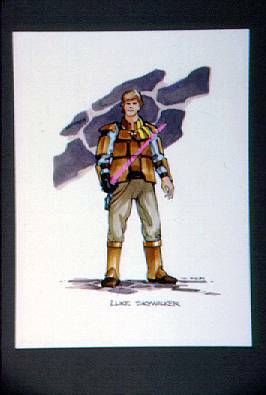 This rendering of a post-ROTJ Luke Skywalker shows him with a red saber, a gloved right hand, and a jacket of sorts, made up of what appear to be individual pieces of armor (Steve Sansweet, in his Star Wars Galaxy article on unproduced toys, mentioned a concept for a Luke figure in a lightweight training outfit). I like Luke's outfit a good deal more than I do that of his counterpart, Han Solo; it seems a lot more believable to me. Actually, something about this Luke drawing reminds me of Dash Rendar.